I've got to be honest. Lately I've been feeling a bit ho hum and unmotivated with sewing. 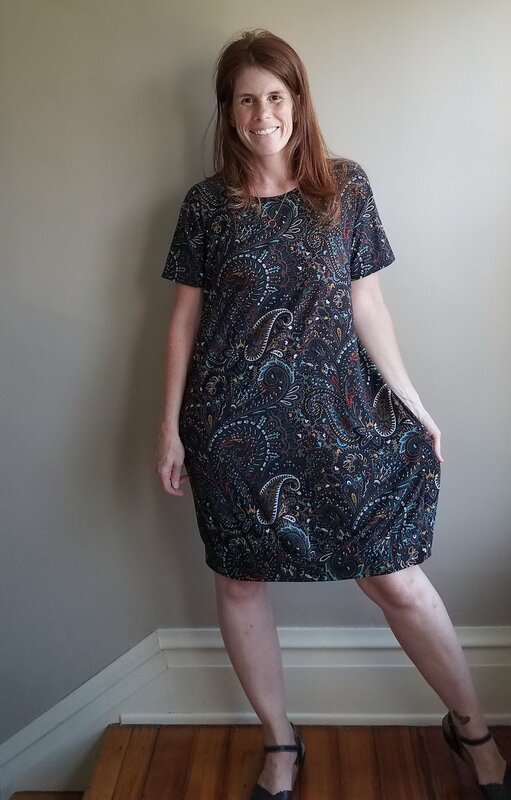 Pattern testing is a great motivator though (deadlines, camaraderie, a new pattern), so I jumped on the tester call for the Pixie Tee by Chalk and Notch. I pretty much love all of Gabriela's patterns. She has an incredible eye for on trend and interesting design elements. Each pattern she puts out feels fresh and different. So while Pixie is a tee pattern, it's anything but basic and ordinary. The shoulder is slightly dropped and there's 2 options for the hem as well as 2 sleeve options AND dress length included. Since I was looking to add some spark to my sewing, I took myself out of my comfort zone here and sewed a dress version of Pixie. I used a brushed poly found in my stash (sourced from LA Finch Fabrics, if memory serves) so in essence this dress is pretty much like wearing a dreamy cloud. If it weren't a billion degrees outside, I'd totally be sewing this view of Pixie in chunky sweater knit fabric, perhaps with a funnel neck modification. Oh, yes. Bring on fall. Modeled with a Joy Jacket. While I haven't played with the tie hem option yet(! ), I've actually been sewing a lot of Pixies since testing. I'm hoping to perfect a hack to share soon. This pattern was very graciously given away for free to subscribers of the Chalk and Notch newsletter in much the same way Gabriela offered the Pony tank for free last summer. If you weren't on the list before the emails with the free code went out, I'm happy to report I've got an opportunity to give away a copy of the Pixie PDF pattern. Enter via the Rafflecopter below. (But do go ahead and get yourself on the Chalk and Notch newsletter list, already. Duh.) Thanks for stopping by!